Every marketer tells a story. And if they do it right, we believe them. We believe that wine tastes better in a $20 glass than a $1 glass. We believe that an $80,000 Porsche Cayenne is vastly superior to a $36,000 VW Touareg, which is virtually the same car. We believe that $225 Pumas will make our feet feel better-and look cooler-than $20 no-names . . . and believing it makes it true. This is a book about doing what consumers demand - painting vivid pictures that they choose to believe. Every organization-from nonprofits to car companies, from political campaigns to wineglass blowers-must understand that the rules have changed (again). In an economy where the richest have an infinite number of choices (and no time to make them), every organization is a marketer and all marketing is about telling stories. Advertising's fundamental theorem-that perception trumps reality-informs this dubious marketing primer. Journalist and marketing guru Godin, author of Purple Cow: Transform Your Business by Being Remarkable, contends that, in an age when consumers are motivated by irrational wants instead of objective needs and "there is almost no connection between what is actually there and what we believe," presenting stolid factual information about a product is a losing strategy. Instead, marketers should tell "great stories" about their products that pander to consumers' self-regard and worldview. Examples include expensive wine glasses that purport to improve the taste of wine, despite scientific proof to the contrary; Baby Einstein videotapes that are "useless for babies but...satisfy a real desire for their parents"; and organic marketing schemes, which amount to "telling ourselves a complex lie about food, the environment and the safety of our families." Because consumers prefer fantasy to the truth, the marketer's duty is to be "authentic" rather than honest, to "live the lie, fully and completely" so that "all the details line up"-that is, to make their falsehoods convincing rather than transparent. 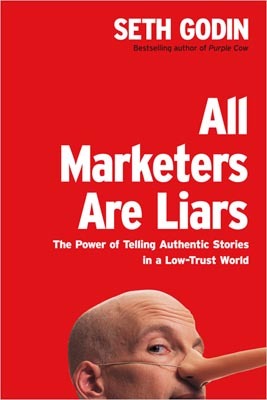 Troubled by the cynicism of his own argument, Godin draws a line at deceptions that actually kill people, like marketing infant formula in the Third World, and elaborates a murky distinction between "fibs" that "make the thing itself more effective or enjoyable" and "frauds" that are "solely for the selfish benefit of the marketer." To illustrate his preferred approach to marketing, the author relates a grab bag of case studies, heavy on emotionally compelling pitches and seamless subliminal impressions. Readers will likely find the book's practical advice as rudderless as its ethical principles.